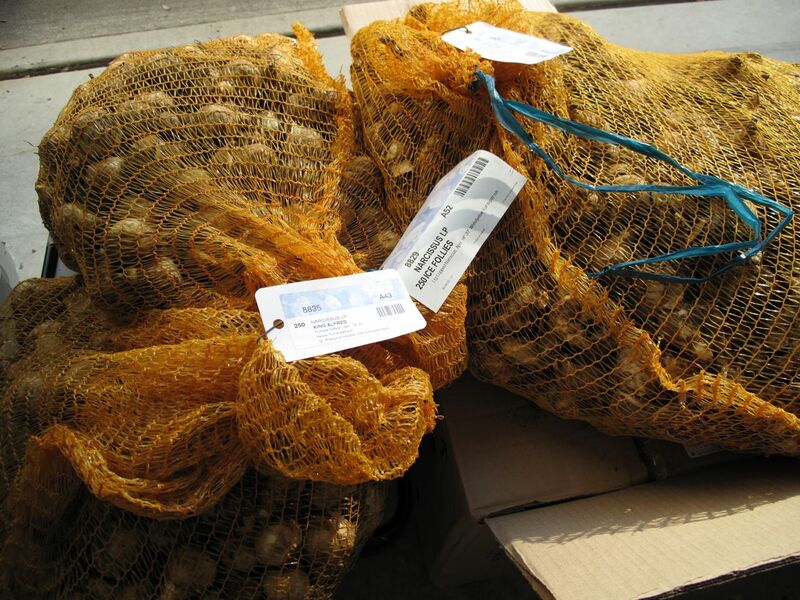 One thousand daffodil bulbs sit in my garage awaiting planting this weekend. Happily I am not responsible for the actual planting. Who knew how heavy bulbs can be? The grounds committee for my neighborhood, of which I am a member, ordered 500 Ice Follies and 500 King Alfred to be distributed among our central common areas and around our eight cul-de-sacs. 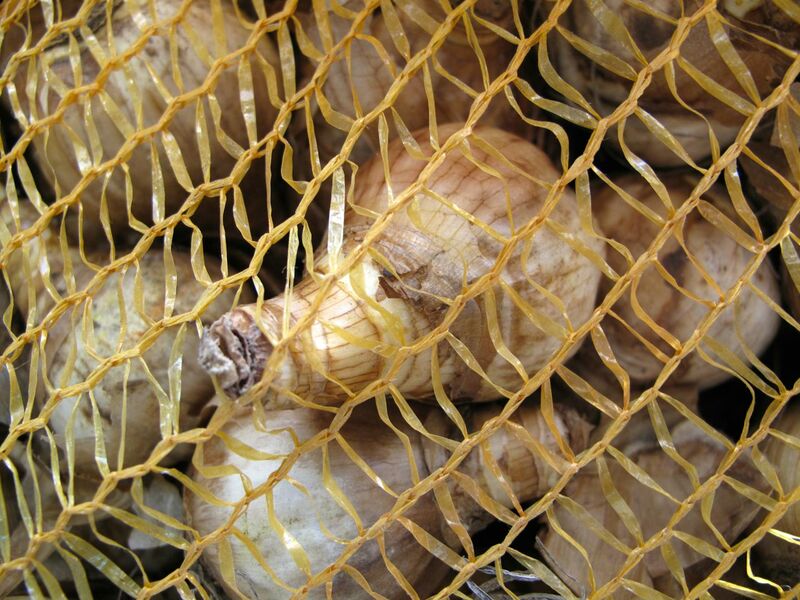 I pushed for one large river of daffodils, but am satisfied these bulbs will make a nice welcome in spring. 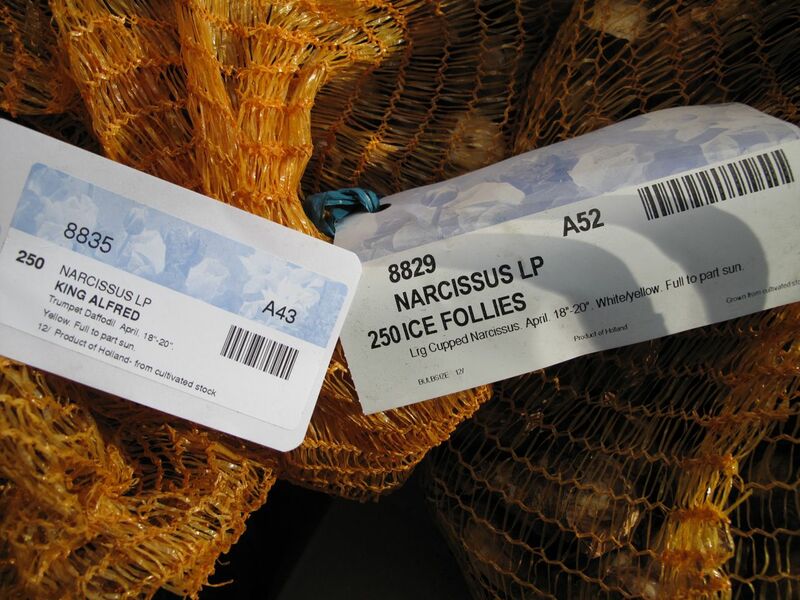 Narcissus bulbs will brighten the neighborhood in spring. This entry was posted in garden and tagged narcissus on November 12, 2014 by pbmgarden. They are heavy aren’t they…what a great project. Yes, I’d only handled bags of 25 before. That will look beautiful. The men who planted our bulbs this weekend had a similar setup but the ground in our neighborhood is so hard it made for difficult digging. Marvellous! And they will naturalize to produce even more. Don’t forget to take pictures this spring! I have grand hopes of the bulbs naturalizing. Camera is ready! A wonderful community project. It will be breath taking over the years as they bulbs naturalize beyond this 1st planting. There should be some sort of award that you receive for adding beauty in your corner of heaven. Congrats. Seeing these daffodils bloom come spring will be the best reward. I do hope they work out well. I remember ordering a bushel of daffodils some years ago and particularly remember what a chore it was to get them in the ground. I’m glad for your sake that it is a community project. Wow-bet that took more than a few hours, but beautiful in the spring. I’ll stick to bags of 25 at a time! Wow, that’s going to be gorgeous in the spring! What a great thing for the neighborhood group to do! Beth, I sure hope the daffodils do well in the spring. The grounds committee easily agreed on this project. Your area sounds a great area to live with projects like this Susie. I’m in the middle of planting some narcissus in the cuttings bed, I can’t wait for spring! I do think we live in great community–lots of good volunteers. Your cutting beds were fabulous and the narcissus will be a great addition. Happy planting! What a wonderful idea, it will all be beautiful in the spring, you will have people travelling miles to see them! Pauline, it would be great if our neighborhood became the daffodil community. Maybe we can keep adding more bulbs each year to finally achieve the “river of daffodils” idea. That will be a lasting gift to your neighbourhood Susie. We had a similar project in our village, one lady championed the project some years ago and with only a couple of helpers mass planted with King Alfreds throughout the village. We all benefited and it looks so cheerful in Spring. Julie, your village must be a cheerful place when those King Alfreds are in bloom. Hope this project works out as well. I hope we will keep adding more bulbs each year and of course they will naturally multiply. Just in time for cold weather! Hope someone will make hot cocoa for the group. We’ve had community planting days before, but actually we’ve hired someone to do the planting this time. Maybe the promise of hot cocoa would have tipped the decision the other way. Wish I could help you plant. 🙂 I can only imagine how pretty it will look. Thanks Judy, I’ll post photos in spring. Love how bulbs build our anticipation of spring. Thankfully my back will be spared the planting. Hope they will do will so I can post a cheerful picture of them in spring. What a fabulous idea – I think we ought to borrow it here! Happy planting – I’m hoping to do the same thing in my garden this weekend. Oh yes, Cathy, everyone will appreciate the daffodils if you start a similar project. I have some bulbs of my own that will have to wait a few days. Happy planting! When I saw how many bulbs we have to plant I realized we made the right decision not to try to do them ourselves this year. Really looking forward to seeing the daffodils in the spring. What a great idea to brighten up the neighbourhood. I remember planting 25kg last year and it was quite tough planting them all but worth the effort! Bet it looked amazing Annette. Spring should be colorful. It turned quite cold here and I’m glad not to be out planting today. Your are right. Before seeing the actual number in person I might have been tempted, but now will always stick to bags of 25 or fewer. Let’s hope spring comes soon!